Summary and Definition: The Helsinki Accords were a series of agreements that were signed in August 1975, during the period of Detente, by leaders of the USA, the USSR and 35 nations who were members of NATO and the Warsaw Pact. The Helsinki Accords dealt with three main issues of cooperation, security and human rights. Under the Helsinki Accords the nations of the East and West agreed to forge cultural links aimed at bringing the USA and the USSR closer together. It was agreed that the parties would recognize the borders of Eastern Europe that were established at the end of WW2 and in return the USSR promised to uphold basic human rights that included allowing people in the Eastern Bloc the right to move across borders. The Helsinki Accords were a formal agreement between countries but were not binding as they did not have the same status of a bonafide treaty. The USSR went on to ignore its promises about human rights, tarnishing the spirit of the Helsinki Accords. 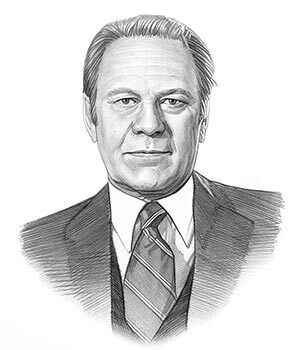 Gerald Ford was the 38th American President who served in office from August 9, 1974 to January 20, 1977. One of the important events during his presidency was the Helsinki Accords. Helsinki Accords Facts - 1: In the summer of 1975, the Conference on Security and Cooperation in Europe (CSCE) met and produced the Helsinki Accords which, in keeping with Detente, attempted to improve diplomatic and political relations between the Communist bloc and the West. Helsinki Accords Facts - 2: The Conference on Security and Co-operation in Europe opened at Helsinki, Finland on 3 July 1973 and continued at Geneva from 18 September 1973 to 21 July 1975, was concluded at Helsinki on 1 August 1975 when the agreement was signed by representatives of all the participating nations. Helsinki Accords Facts - 4: United States President Ford pursued the concept of Detente aimed at easing tensions between the East and West. With this in mind he made the decision to attend the final stages of the 1975 Conference on European Security and Cooperation in Helsinki, Finland to sign the Helsinki Accords. Helsinki Accords Facts - 5: The 35 countries who signed the Helsinki Accords were Austria, Belgium, Bulgaria, Canada, Cyprus, Czechoslovakia, Denmark, Finland, France, the German Democratic Republic, the Federal Republic of Germany, Greece, the Holy See, Hungary, Iceland, Ireland, Italy, Liechtenstein, Luxembourg, Malta, Monaco, the Netherlands, Norway, Poland, Portugal, Romania, San Marino, Spain, Sweden, Switzerland, Turkey, the USSR, the UK, the USA and Yugoslavia. Helsinki Accords Facts - 7: The Conference was hailed as a success and the Helsinki Accords was viewed as a significant step towards reducing Cold War tensions. Helsinki Accords Facts - 8: The Helsinki Accords was a formal agreement but was not binding as the Accords did not have the same status as a treaty. The following fact sheet continues with facts about Helsinki Accords. Helsinki Accords Facts - 9: The USSR went on to ignore its promises about human rights which led many people to disagree with the continuation of Detente. Helsinki Accords Facts - 10: Although the Soviets chose to ignore the agreements made about the Civil Rights of its people, many of their own people took the Helsinki Accords seriously. Helsinki Accords Facts - 11: Critics of the Helsinki Accords believed that the agreements gave far too much control of Eastern Europe to the Soviet Union. The famous Soviet dissident Alexander Solzhenitsyn denounced the Accords as “the betrayal of Eastern Europe”. Helsinki Accords Facts - 12: A number of human rights groups emerged to monitor the USSR's compliance with the Helsinki Accords. Organizations such as the Helsinki Watch were founded by a collection of Soviet dissidents and became one of the loudest critics of Soviet human rights policies. Helsinki Accords Facts - 13: The Soviet Civil Right issues would not be resolved until the 1980's when Glasnost was introduced by Mikhail Gorbachev and the Collapse of the Soviet Union in 1991. The article on the Helsinki Accords provides detailed facts and a summary of one of the important events during his presidential term in office. The following Gerald Ford video will give you additional important facts and dates about the political events experienced by the 38th American President whose presidency spanned from August 9, 1974 to January 20, 1977.